This Is It Illuminati Signs and Other Symbols. It has recently come to our attention that Conrad Murray supporters will be demonstrating at the preliminary hearing, June 14th at the Superior Court of Los Angeles, much like Michael’s supporters have always done. This is their right just as it is ours. We would like to urge fans that are planning to attend to please do so in peace, unity, and love for Michael. There should be NO violence, NO slander, NO yelling, and NO bad-mouthing or name-calling of Murray or his supporters. This reflects negatively on Michael. He would not support this type of behavior. The press called Michael names that were undeserved and hurtful. By acting out and creating chaos, our message can not be heard or is overshadowed by our behavior. By calling names, we are lowering ourselves to their level. That would only contribute to the filthy tabloid gossip. Michael deserved better than that. We must honor him, his wishes, and his message of peace and compassion, even in the face of opposition. Both sides can peacefully co-exist and let the justice be served inside the courtroom, just as it has been before. Please ignore their signs, actions and words. DO NOT acknowledge their presence, IGNORE them completely, and certainly do not respond to anything they have to say. DO NOT let them bait you into an argument or lashing out to defend Michael. That is what they want. Our protest should be silent. We do not want to draw any attention to them at all. The world needs to see Michael’s light shining through all of you instead. Our message is much bigger, better, and more dignified by not using slanderous or vulgar words. Your respect will make a much larger statement that will be revered instead of criticized. Their behavior toward a silent prayer vigil will only make them look bad. They cannot fight if there is no one to fight with. Do not give them the fuel for their fire. Please do not even acknowledge their banners. Our banners will stay the same: “Justice for Michael”. We all have a common, unifying mission, which is JUSTICE FOR MICHAEL. We do not have to respond to them at all, because Conrad Murray supporters are not on the side of righteousness or justice, they are wrong, and right will prevail. This is much deeper than just a demonstration. This will go down in history. Whatever your actions are that day, will be part of Michael’s legacy. When people look back on this day we want them to remember Michael, not Conrad Murray. Michael Jackson supporters are not to be looked down on as crazed fanatics, but as crusaders for peace and love. This is what Michael Jackson is, was, and always will be. It is what he believed in and stood for. We are HIS voice, representing HIM. MICHAEL IS LOVE AND PEACE, NOT HATE! This is the message we must unite to send to the world. You have caught the attention of the entire world; you represent their conscience and inspiration. This is your chance to impact Michael’s legacy and reputation for generations to come. We must stand together to honor him. We can shut them out completely and let our message speak for itself. The most powerful impact you can have in carrying on his legacy, is spreading his peace and love. Our silent protest and prayer vigil will be seen and felt the world over. Make Michael proud! Carl Toms is planning to publish a VERY slanderous book about Michael called “Dangerous Liasons“, and it is expected to come out in June of 2010. We are not yet able to leave comments on the book on Amazon but we can write letters to the publisher and also tag the book on the Amazon site. …and you can add your own. You can tag the book with certain keywords. Scroll down and look for ‘Tags Customers Associate With This Product‘. You’ll see tags like: garbage • trash • lies – and you can add your own tags (please be civil – NO foul language!). For comments, go to the link where the book is sold and scroll down. You will find discussions about the book under ‘Customer Discussions / This Product’s Forum‘. Leave your comments there. Again, be factual, calm, and civil but firm! No YELLING and no foul language! Michael would not approve of that yelling, hysterics, and foul language! You may also write to AMAZON about this book at: http://www.amazon.com/gp/help/reports. Please respectfully ask them not to carry such books which denigrate Michael Jackson’s name and memory, as a matter of truth, conscience and respect for an INNOCENT, deceased man. The facts support the truth. The media and money-grubbing publishers wish to perpetuate the lies for profit. Any reputable bookseller would not participate in the sale of lies for profit and in degrading the name of the innocent when they are no longer here to speak for themselves. This is unconscionable and immoral. The following is a sample letter that people can follow when writing to the publishers of Carl Tom’s book. I’m writing to give you fair warning that your soon-published book “Michael Jackson’s Dangerous Liaisons” by Carl Toms disparages the reputation, person and legacy of Michael Jackson, and therefore the book will have a hard time generating any sales and that its publication may result in legal action from Mr. Jackson’s Estate. To prove my point, I share with you the Customer Reviews page for Shmuley Boteach’s book, “The Michael Jackson Tapes,” at Amazon.com. Boteach’s book was literally driven off the shelves in record time. Mr. Toms’ proposed book will be too, since it is slanderous in nature and doesn’t accurately portray Michael Jackson as the genius entertainer, generous humanitarian and loving father/brother/son/friend and innocent man that he was. For too long, Michael’s dignity—his very person—was violated at its deepest dimension. He was the subject of a cruel spectacle on the world stage. Names were created by the media to ridicule him—“Wacko Jacko!”—and pejoratives—“Weird!” “Strange!” “Bizarre!”—were applied to him at every turn. The sole purpose in all this was to bring the rage of public opinion to bear on him so he would suffer to the very depths of his being. Mainstream media, including publishers of books by disreputable authors with dubious agendas, have turned into the schoolyard bully. There exists a veritable army of Michael Jackson advocates and people with a moral conscience who refuse to accept further denigration of Michael Jackson’s character, legacy and reputation. We stand ready to take action against your book. Just because Michael passed away doesn’t mean he has no one looking after his interests. We further suggest that you carefully analyze your market. Michael Jackson Haters don’t care to spend money on such a book. Michael Jackson Advocates will destroy such a book. Word is already out among Michael Jackson advocates and others with a moral conscience worldwide that this book is not worth the paper it’s printed on. We are not yet able to leave comments on the book on Amazon but we can write letters to the publisher and also tag the book on the Amazon site.Look for ‘Tags Customers Associate With This Product’You’ll see tags like:garbagetrashlies…and you can add your own. There’s nothing that can’t be done if we raise our voice as one. First, it’s necessary to define a new term. Medialoid (mainstream media infected by tabloid journalism) publishes content that is more suitable for tabloid publications. Part 1 — Professionalization of Journalism. Many occupations require licensing; for example, doctors, lawyers, architects, and accountants must be licensed in all 50 states. To qualify, one must graduate from an accredited university and pass a rigorous board examination. A license doesn’t guarantee a doctor, lawyer, architect, or accountant will be competent. However, licensing prevents a plumber from operating on a person, a homemaker from arguing in court, a dog groomer from designing a building, or a student from maintaining the books of a corporation. Is it no less important that those entrusted with reporting world events be licensed? Reporters should not be allowed to call themselves journalists unless they graduate from an accredited university with a degree in journalism (including at least one course in journalism ethics and one course in communications and media law) and pass a rigorous board examination. Media play a huge role in our lives. Television, radio, the Internet, movies, books, and newspapers inform and influence our ideas, opinions, values, and beliefs. They shape our understanding of the world and give us the information we need to hold our leaders accountable. They help us separate fact from opinion. If formal journalism training and licensing had been required of Diane Dimond and Nancy Grace, neither would have been hired by any news organization. If either had been hired without credentials, the news company that hired them may have been fined for hiring unlicensed persons. Clearly, if Dimond and Grace had not been perceived as journalists, their works of fiction may not have confused the public. The Society of Professional Journalists believes that public enlightenment is the forerunner of justice and the foundation of democracy. The duty of a journalist is to further those ends by seeking truth and providing a fair and balanced account of events and issues. Conscientious journalists strive to serve the public with thoroughness and honesty. Professional integrity is the cornerstone of a journalist’s credibility. A journalist shall lose his or her license for failing to adhere to principles of journalistic ethics and integrity. Part 2 — Defaming the dead shall be prohibited. A deceased person’s heirs can sue for libel and slander as aggressively as the person who was defamed when he or she was alive. These statements have not been evaluated by the Food and Drug Administration. These products are not meant to diagnose, treat or cure any disease or medical condition. The views expressed herein may not have been fact-checked or verified according to principles of journalistic ethics and integrity. In addition, rumor, barely credible sources, an appeal to emotion and the use of checkbook journalism may be a part of this story or program. This story or program is for entertainment purposes only and was not reviewed by a licensed journalist. The Federal Trade Commission (FTC) protects against deceptive advertising that is misleading to the public. In like manner, a governing body shall be formed to uphold standards of ethics and integrity in journalism, oversee licensing for journalists, and protect against media practices that are harmful or mislead the public. It will take a long time and much effort to pass this proposed legislation. We need your support. Please join us by subscribing to our newsletter. Michael spoke far too much about love and peace. So just the same as John Lennon and Princes Diana he had to be murdered so as not to interfere with the campaign to keep everybody in a state of fear. 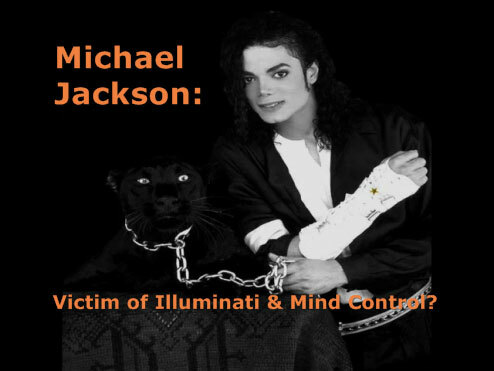 MJ: Victim of Illuminati and Mind Control? This blog is somewhat controversial and shocking and although you might not go with our theory stated in this blog, it is eye opening and will probably make you as mad and sad as we are. We were contacted by someone who asked us if we wanted to end up like Evan Chandler for publishing a blog about Mike/Mind Control & Illuminati, but since this is just a theory and the net is all over with articles about this topic, we will post it. There are a lot of people trying to keep us hoaxers from the truth by scaring them and telling half truths, but we have thought this out and unfortunately this fits. The twin-theory might have been off, but if this theory turns out to be true, it wasn’t even that far fetched. Although we are still convinced that Mike is alive, the conclusion we get to at the end of this blog will rip your heart out and throw it into a dark place where it’s not easily found again, so consider yourself warned, it’s not some light reading.